Ahmadinejad: Holocaust 'Opinion Of Just A Few' In an NPR interview, Iranian President Mahmoud Ahmadinejad calls the deaths of millions of Jews a "historical event" and addresses questions about human rights in his country, Iran's nuclear aspirations and his opinion of President Obama. Iranian President Mahmoud Ahmadinejad says in an interview with NPR that the Holocaust is a "historical event" and that Iranians are free to criticize the government. He also addresses questions about human rights and nuclear aspirations in his country, and praises President Obama's break with policies of previous U.S. administrations. He told Inskeep: "I'm not a historian. Most certainly, I've read a lot of books about this issue, and that is why I have questions about it. My questions are very clear ones. We should allow researchers to examine all sorts of questions because it's quite clear that when they do, they will reach different conclusions." In the interview, he complained that the event is given too much prominence, particularly by many politicians who use the Holocaust to justify actions that hurt Palestinians. "I can see that genocide is happening now under the pretext of an event that happened 60 years ago," he said, speaking through an interpreter. "Why should the Palestinian people make up for it?" The Holocaust discussion was one portion of a wide-ranging interview, conducted on the sidelines of the U.N. General Assembly in New York. Ahmadinejad also discussed the fate of demonstrators in Iran who have been protesting the recent election, praised President Obama for what Ahmadinejad views as criticism of previous U.S. administrations, and addressed his country's nuclear program. Asked about the many democracy protesters who remain jailed after Iranian security forces violently broke up demonstrations following the country's election in June, Ahmadinejad insisted that Iranians were free to criticize their government. "In Iran, no one is in prison because of opposing Ahmadinejad," he said. "In Iran, there is freedom and people can speak their minds." Thousands of people were detained by Iranian security forces in the wake of the dramatic June protests, in which dozens of protesters were also killed. Many of the jailed demonstrators were released, with officials saying that fewer than 200 remain in custody. During a lengthy exchange, the Iranian leader also confirmed widespread allegations that some prisoners were tortured in custody, calling it "regrettable." He suggested that foreign countries were responsible for provoking the unrest. But when pressed, he said members of his security forces "may lose their jobs" if they are found guilty of abuses. As for the fate of those who remain in prison, Ahmadinejad said he hopes they will be released but added that the security forces must have had good reasons for arresting them. "I'm not in charge of judgments in Iran," he said. "The judicial system in Iran is an independent body of its own, and it follows the laws, and it must operate according to the law." While conceding that some protesters may have been incorrectly imprisoned, he said he had to respect the justice system. "I do not want to say that what actions are taken by the judges are always 100 percent correct, but for there to be order in society, we have to accept the orders of the judge. Otherwise, there will be no security," he said. Ahmadinejad praised Obama's speech to the U.N. for marking a break with the policies of the Bush administration. The Iranian president said Obama echoed what the Iranian people and Ahmadinejad himself have been saying for many years. "He said yesterday that previous U.S. administrations acted unilaterally, that they intervened in the affairs of other countries, they wished to enforce their will on others, and we were saying the same thing," Ahmadinejad said of Obama. "He said the U.N. system is unfair and must change. I'm saying the same thing. And we will assist in making these things happen." But Ahmadinejad did not offer any apparent new openings, making it clear that Iran still has "deep reservations in the kind of outlook that some Western politicians have with respect to our country." Iran faces the threat of additional sanctions over its nuclear ambitions, with the United States and its European allies pushing for new punishments. Russian president Dmitry Medvedev displayed new flexibility on the issue Wednesday, saying sanctions are in some cases "inevitable," although Chinese leaders signaled that they remain opposed to the idea. On Oct. 1, the United States, Iran and other world powers are scheduled to meet for a discussion on Iran's nuclear program. The meeting represents a new initiative for the Obama administration, which reversed President Bush's policy of refusing to talk to Iranian leaders until they accepted a set of U.S. preconditions. At the talks, Iran has said it will seek to buy enriched uranium for medical purposes from the United States. 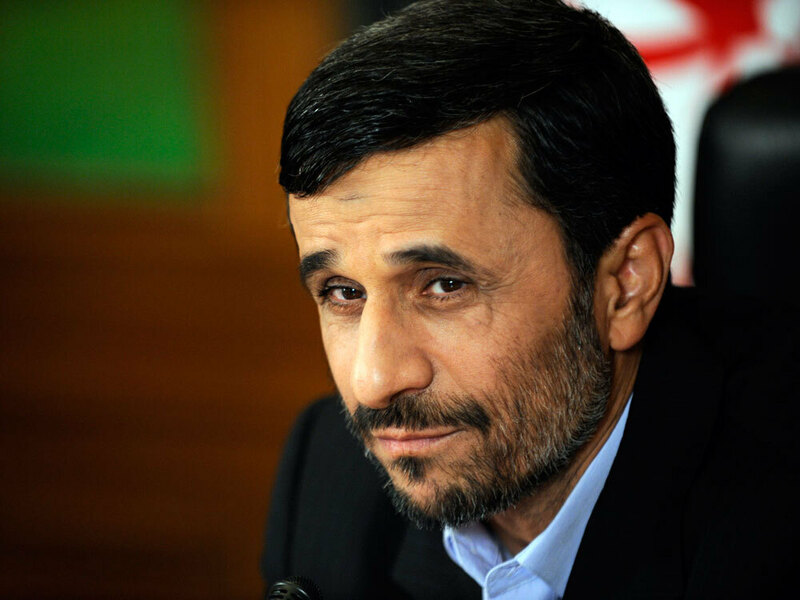 "We want the uranium, and we're willing to purchase it," Ahmadinejad said in the interview. "This is a good way to have exchanges." The request could put Washington in an awkward position. Tehran has long insisted that it seeks nuclear power solely for peaceful purposes, including energy and to run its medical reactor. Being turned down could give Iran an excuse to break away from international negotiations. But U.S. officials are concerned that the lower-grade uranium Iran is seeking could eventually be processed into weapons-grade material. At the same time, Ahmadinejad made no promises about how Tehran would react if the Obama administration ends up approving the sale. "I said it would be a good start," he explained.